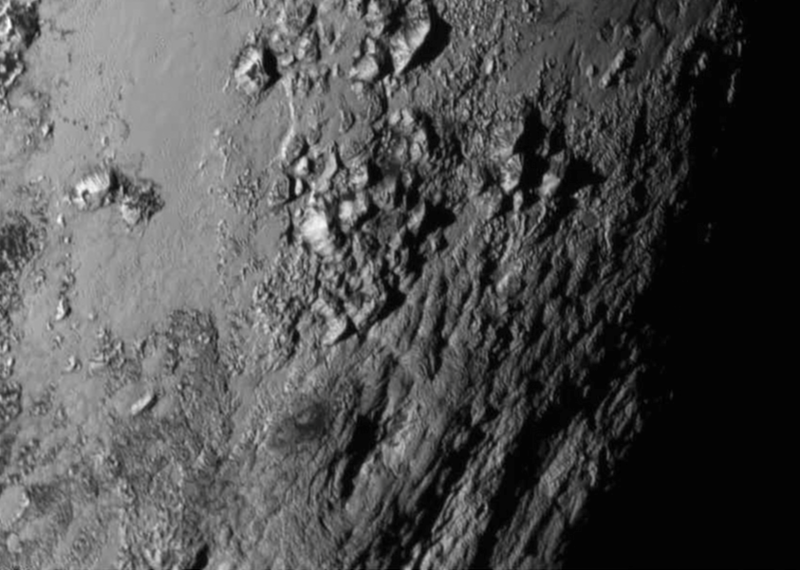 Icy mountains on Pluto and a new, crisp view of its largest moon, Charon, are among the several discoveries announced Wednesday by the NASA's New Horizons team, just one day after the spacecraft’s first ever Pluto flyby. “Home run!” said Alan Stern, principal investigator for New Horizons at the Southwest Research Institute (SwRI) in Boulder, Colorado. “New Horizons is returning amazing results already. The data look absolutely gorgeous, and Pluto and Charon are just mind blowing." The mountains on Pluto likely formed no more than 100 million years ago -- mere youngsters in a 4.56-billion-year-old solar system. This suggests the close-up region, which covers about one percent of Pluto’s surface, may still be geologically active today. The observations also indicate Hydra's surface is probably coated with water ice. Future images will reveal more clues about the formation of this and the other moon billions of years ago. Spectroscopic data from New Horizons’ Ralph instruments reveal an abundance of methane ice, but with striking differences among regions across the frozen surface of Pluto. The Johns Hopkins University Applied Physics Laboratory in Laurel, Maryland designed, built and operates the New Horizons spacecraft and manages the mission for NASA’s Science Mission Directorate. SwRI leads the mission, science team, payload operations and encounter science planning. New Horizons is part of NASA’s New Frontiers Program, managed by the agency’s Marshall Space Flight Center in Huntsville, Alabama.